The church building has undergone an extensive restoration program over the past 10 years with more than $2.5 million worth of work completed. The original building cost $ 30,000 to construct. Designed by Mott, Myles, and Chatwin of St. John, NB and built by the Rhodes Curry and Company of Amherst, Amherst First Baptist Church is among many of the designated historical sites located in Amherst. The exterior of the building is red sandstone, quarried in Amherst and is representative of the materials used in the 1800s in Amherst. The building has been cleaned to remove the years of charcoal soot and reduce the effects of acid rain. Each stone has been cleaned and re-mortared to ensure the building will remain here for another century or more. Amherst First Baptist Church is designed in the Richardson Romanesque architectural style. There has been extensive landscaping done around the building to enhance it's appearance and add to the greenery of the downtown. The property includes plentiful parking in the rear for church or town activities. With its unique round towers , the building attracts the attention of many. The interior is without a doubt one of the more beautiful protestant sanctuaries in the province. The downstairs has a seating capacity of 700 people and the balcony can accommodate another 400 people. Not included in the original construction, the balcony was added in 1907 to handle increased attendance at church. Most of the wood used in the sanctuary is oak and all the furniture was handcrafted here, in Amherst. The centre of the sanctuary reaches 37 feet to the wood panel ceiling. Note the curved shape of the auditorium and the way the balcony follows the curve. Throughout the building are many unique rooms. Upstairs you will find two tower rooms; One is a parlour, and the other one is a proposed office. Both have been completely restored, as has the front entryway. Located on the main floor is the church parlour, meeting room and the church offices. A board room has been completed in a restored section at the back of the church. Upstairs is another parlour as well as the nursery and children's rooms. In the basement are the Sunday school rooms, an auditorium, kitchen and the boiler room. With two fully equipped and modernized kitchens, the members are able to meet any need. Within the church, there are a number of beautiful stain glass windows, many of them originating with the construction of the building. Some were crafted in St. John, NB and others in England. These are memorial windows, as you browse, make note of the persons remembered. All of the windows on the Victoria Street side have been totally restored to their original beauty under the craftsmanship of Sattler's Stained Glass. Four new stained glass windows have been added in the 1990s and were designed and crafted by Northwind studios in Pictou, NS. 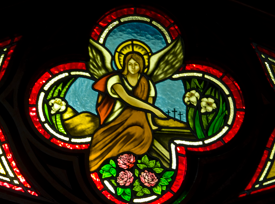 The window over the entrance is entitled ' The Peace Window' and has been featured in stained glass publications all over the world. 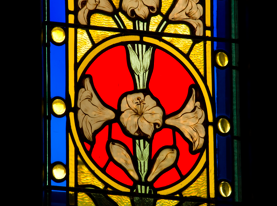 In the vestry, you will find a section of stained glass from the Highland Baptist Church, a daughter congregation of this church. These windows are examples of the dedication and love of the people for their church, and those who have so faithfully served the congregation over the years. please note the bronze memorial plaques at the front of the sanctuary placed in memory of the war dead.